Due date for partnership and S corporation tax returns will soon be here. Due date for 2018 individual, calendar year estates and trusts, and calendar year corporation income tax returns is April 15, 2019. The election to be an S corporation for calendar-year corporations is also due March 15. Trust distribution deadline is March 6, 2019. Remember that an estimated tax payment is also due on April 15. Remember the second California real estate tax payment is due April 10. Cutoff for preparing tax returns will soon be here! Make your tax return preparation interview appointment now. Attention CPAs located in the Silicon Valley area. Check out my latest blog post about the 20% of Qualified Domestic Business Income deduction. Many taxpayers are getting smaller refunds or owe tax this year. Should you consider making a Roth conversion during 2019? Safe harbor issued for depreciating automobiles acquired after September 27, 2017 and placed in service before January 1, 2027. IRS National Office analyses employer-provided meals. Form 1040, Schedule A instructions omit excess deductions from an estate or trust. Payments for "emotional distress" were taxable. Taxpayer allowed to deduct late alimony payments. Franchise Tax Board requests Form 3840 for California Like-Kind Exchanges. Corporate owner of single member LLCs was required to include their apportionment information. Limit on deduction for state and local taxes is causing headaches. Financial Insider Weekly past episodes. 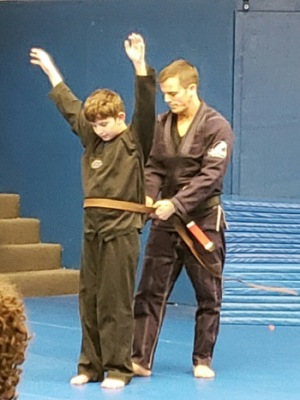 Clive Baker, who is my grandson, receives his brown belt promotion in mixed martial arts. St. Patrick's Day is the occasion when all Americans celebrate being Irish! This year it falls on Sunday, March 17. It's time for the wearin' of the green! The luck of the Irish be with ye! Did you know that St. Patrick used the THREE-leafed clover as an analogy for the Holy Trinity? The four-leaf clover is actually an American tradition. My sister Arlene Gray McLean and my brothers-in-law Wade Allison and Lane Johnston, are celebrating birthdays this month. Happy Birthdays! The due date for calendar year 2018 partnership and S corporation income tax returns is March 15, 2019. If the information for preparing them isn't complete, extension forms should be submitted with the estimated balance of tax by March 15. There is an exception for residents of Maine and Massachusetts. Their due date is April 17, 2019 because of the Patriot's Day in those states and the Emancipation Day holiday in the District of Columbia. Estates and irrevocable trusts for which the trustee has discretion for making distributions can elect to treat distributions made within 65 days after the year-end as made during the previous year. Distributions generally reduce taxable income for the estate or trust and carry taxable income to the beneficiaries of the estate or trust, who might have a lower marginal tax bracket. For 2018 calendar year trusts and estates, the deadline for making a distribution to make the election is March 6, 2019. Trustees and executors should consult with their tax advisor about whether their trust or estate and its beneficiaries would benefit from making such an election. The first 2018 estimated tax payment for individuals and most other calendar year entities is also due on April 15, 2019. The penalties for late payment of estimated taxes are computed as simple interest, but the interest rate has been increasing. The federal estimated payment can be based on 25% of last year's tax liability. California "front loads" the first estimated tax payment as 30% of last year's tax liability. California taxpayers with taxable income of $1 million or more must make their estimated tax payments based on their actual income and deductions. If you provide complete information for preparing your 2018 income tax returns by March 15, your tax returns should be finished in time to file them by April 15. Otherwise, an extension form should be submitted with a payment of any estimated balance of tax by April 15. There is still time for a few personal interview appointments for preparing 2018 individual income tax returns. Many clients send their information without having an interview, but if you need that personal attention, you should schedule your interview appointment now. Call Ms. Thi Nguyen, CPA at 408-286-7400, extension 206. Are you overloaded for review of income tax returns this tax season? Do you need a sanity check or research relating to a complex tax issue? Maybe I can help on a project basis. Call me, Michael Gray, at 408-918-3161 or email mgray@taxtrimmers.com. I wrote a blog post about the final Treasury regulations at www.michaelgraycpa.com/posts/irs-issues-final-regulations-for-the-20-of-qualified-domestic-business-income-deduction/ Hope you'll find some valuable information there. Many taxpayers should consider whether to convert their "regular" (taxable) IRA to a Roth IRA account during 2019. The price can be steep - the conversion is taxable. Advantages of the Roth include tax free growth and no required minimum distributions after reaching age 70 1/2. It seems likely federal income tax rates will increase after Trump leaves office. Before going ahead, consult with a qualified financial planner or tax advisor. Under the new tax law, you can't "undo" a Roth conversion. Under the Tax Cuts and Jobs Act of 2017, when a taxpayer elects to claim 100% bonus depreciation for a passenger vehicle subject to annual depreciation deduction limitations as a "luxury vehicle," the no deductions for the undepreciated amount in excess of the first year limitation ($18,000 for 2018) is allowed until the first year after the end of the recovery period. For example, for an 100% business-use automobile that costs $50,000 purchased and placed in service on June 30, 2018 for which 100% bonus depreciation is elected, the deduction for 2018 would be $18,000. No depreciation would be allowed for 2019 - 2023. The excess amount up to the annual limit, ($32,000 limited to $5,760) would be allowed for 2024. The IRS has issued a Revenue Procedure to bypass the requirement to not depreciate the vehicle for intervening years. Under the Revenue Procedure, the remaining basis ($32,000 in the above example) would be depreciated using the percentages on the MACRS table for the remaining years, subject to the luxury vehicle limitations. (For a vehicle subject to the half-year convention, the percentages would be 32% for year 2, 19.20% for year 3, 11.52% for years 4 and 5, and 5.76% for year 6. The annual limits would be $16,000 for year 2, $9,600 for year 3, and $5,760 thereafter.) In the example, the depreciation would be the lesser of $10,240 or $16,000 for year 2, or $10,240, the lesser of $6,144 or $9,600, or $6,144 for year 3, the lesser of $3,686 or $5,670, or $3,686 for years 4 and 5, and the lesser of $1,843 or $5,670 for year 6. After the recovery period is over, any remaining basis is deductible, subject to the annual limitation. In the example, the remaining basis is $50,000 (cost) - $43,599 (total depreciation deductions) = $6,401. The deduction for year 6 would be the lesser of $6,401 or $5,670, or $5,670. The deduction for year 7 would be the lesser of the remaining basis, $6,401 - $5,670 = $731 or $5,670, or $731, leaving no remaining basis. A taxpayer adopts the safe harbor method of accounting by applying it to deduction depreciation of its passenger automobile on its federal income tax return for the first taxable year after the year the passenger automobile is placed in service. If a taxpayer elects to use the Section 179 expense election instead of 100% bonus depreciation, the Revenue Procedure won't apply, because depreciation deductions aren't suspended in that case. It seems to me almost all taxpayers will want to use the safe harbor method, since it results in more depreciation deductions sooner than if they don't use it. The IRS National Office has issued a Technical Advice Memorandum about free employee meals. Under Internal Revenue Code Section 119(b)(4), all meals furnished on the business premises of an employer to its employee are treated as furnished for the convenience of the employer and excludable from the employee's income, if more than half of the employees to whom the meals are furnished on the premises are furnished the meals for the convenience of the employer. The IRS National Office concluded in this case the taxpayer didn't show that at least half of its employees were furnished meals for the convenience of the employer and the meals were taxable to its employees. I think its likely the employer taxpayer will litigate this conclusion. This seems like a benefit that is impossible to track with the detail the IRS is requiring to compute a taxable benefit for each employee. The IRS National Office agreed with the taxpayer that the value of snacks provided to employees are excludable as a de minimus fringe benefit. Employers who provide free employee meals on their business premises, such as in employee cafeterias, should discuss this ruling with their tax advisors and possibly with their representatives in Congress. This is a very widespread practice in Silicon Valley. The IRS has said it will eventually issue guidance relating to excess deductions from an estate or trust. The Tax Court ruled that payments to a fired employee for emotional distress were taxable. Only payments for physical injuries are excluded from taxable income. The Tax Court rejected the taxpayer's argument that he suffered physical illness as a result of his emotional distress. Jeffrey Siegel fell behind in making alimony and child-support payments. Finally he made payments of $225,000 in spousal support and $25,000 child support after a contempt order by the New York Supreme Court. The IRS claimed the alimony payment wasn't tax deductible because it was made as a money judgment. The Tax Court found the $225,000 alimony payment was tax deductible. It said lump-sum payments of alimony arrearages retain their character as alimony. It also said the contempt order gave Siegel the choice of making the payment or going to jail for 150 days. It did not require the payment if Siegel elected to accept the jail term. The California Franchise Tax Board has been contacting taxpayers who exchanged California real estate for out-of-state real estate but failed to file Form 3840 or filed an incomplete form. Evidently, some tax return preparation software didn't generate the form. (Maybe the input was missed?) In some cases, the second page of the form was omitted or incomplete. Please remember to include this form each year after exchanging California real estate for out-of-state real estate until the out-of-state property is sold, or the taxpayer dies. The Franchise Tax Board has the discretion to accelerate the tax on the gain if the form isn't filed. Six single member California LLCs paid nonconsenting nonresident tax on the share of income of a nonresident corporate owner. The corporation didn't include the apportionment information for the LLCs because it said the tax was already paid. The California Supreme Court denied the petition of the corporate owner of the ruling by a California court of appeal that the apportionment information was required to be included on the corporation's income tax return. Under the Tax Cuts and Jobs Act of 2017, the federal income tax deduction for state and local income taxes is limited to $10,000. There are many questions relating to this limitation. If there is a combination of income taxes, real estate taxes and personal property taxes exceeding the limit, which is being allowed? This issue relates to things like whether the tax relates to investment income and is deductible when computing the net investment income tax or whether a refund of state income taxes isn't taxable because there was no tax benefit for the deduction. There are no IRS guidelines relating to these matters. Evidently, tax return software providers are handling it by proration, but that might not be to the tax benefit of the taxpayer. As you know, more and more people are going to the internet to find information about service providers. We hope you will share some good words about experiences that you have had with our firm<. Some of the sites where you can share your experiences include yelp.com and siliconvalley.citysearch.com. We use Angie's List to assess whether we're doing a good job keeping valued customers like you happy. Please visit AngiesList.com/Review/4258970 in order to grade our quality of work and customer service. After eight years of production, I have discontinued producing new interviews for Financial Insider Weekly. Doing the show has been a rewarding experience and I consider back episodes to be my legacy of financial literacy education to our community. Back episodes available at https://www.youtube.com/user/financialinsiderweek.